The sharp, hot nature of Pitta dosha needs to be soothed with foods that are cooling. Bring the oily nature of Pitta into balance with the help of dry foods in your daily diet. Include some “heavy” foods that will provide substance and steady sustenance to your fast-burning constitution. Here are some specific dietary recommendations for Pitta dosha meals that will keep your constitution in equilibrium. Pitta is hot, sharp, light, oily and acidic, so your diet should be such that these qualities are neutralized. Your dosha type should opt for foods that are cooling, mild, dry, grounding, stabilizing and dense. Fiery Pittas should eat foods that have a cooling essence or that are cool in temperature. Sweet juicy fruits like pears can cool a flaming Pitta quickly. Spices that are not too pungent or heating like turmeric, cumin, coriander, cinnamon, cardamom and fennel are preferable. Your body type also benefits from raw foods which tend to have a cooling quality – especially during spring-summer. Conversely, you should stay away from hot dishes and foods with a sharply warming influence like alcohol and caffeine. While you must certainly pick foods with a heavy quality to offset Pitta’s lightness, do keep deep-fried and processed foods at arm’s length as they are not conducive to good health. You would benefit from grounding the lightness and heat of your body type with nourishment – consuming foods that are solid, stabilizing sources of energy and nourishment. Usually, these will be foods that are naturally sweet. Milk, sweet rice pudding, root vegetables, coconut and coconut milk, seeds and smoothies made with ripe mangoes and almonds or dates are examples of soothing Pitta-pacifying foods. 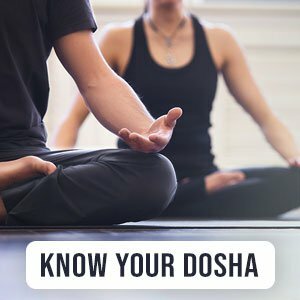 Your dosha has a tendency to have a sharp and voracious appetite, so you must learn to hold back and not overindulge. The oily, spreading nature of Pitta can be balanced with drying or astringent foods like beans, potatoes, corn, millet, oats, pasta and most vegetables. Ghee is cooling for both mind and body, so use it in moderate quantities as your cooking medium. You must reduce or avoid eating foods such as oily snacks, eggs, hard cheeses, olives, nuts, sour cream, etc. While you might enjoy the sharp, tangy flavors of pineapple, pickles, vinegar and aged cheeses, these foods are detrimental to Pittas. The mild tastes of apples, cucumbers, lime and soft cheeses are better suited to your constitution. The sharp, penetrating qualities of stimulants such as caffeine, nicotine and alcohol can throw you off kilter. Choose stable and sustaining sources of energy. The three Ayurvedic tastes that help balance Pitta are sweet, bitter and astringent. A Pitta-pacifying diet will mean eating less of the sour, pungent and salty tastes. Sweet foods are cooling and heavy along with having anti-inflammatory properties which is beneficial to Pitta people who suffer from skin breakouts. Eat more of sweet foods like sweet fruits, most grains, squashes, root vegetables, milk, ghee&nbsp;and yogurt. A note of caution: Avoid eating refined sugar or sugary sweet foods and only consume foods that are naturally sweet. The bitter taste is very cooling, but it is also drying. Bitter greens like kale, dandelion greens and collard greens are your go-to. You should eat more of bitter melon, Jerusalem artichokes and dark chocolate apart from Pitta-pacifying spices mentioned below. Rough and dry is what captures the essence of the astringent taste – imagine sipping a strong black coffee. It is essential heavy and cold. The astringent taste is found in legumes (such as beans and lentils), fruits (including cranberries, pomegranates, pears, and dried fruit), vegetables (such as, broccoli, cauliflower, artichoke, asparagus and turnip), grains (such as rye, buckwheat, and quinoa), spices and herbs (including turmeric and marjoram), coffee, and tea. Being light and hot, it can aggravate Pitta causing you to experience excessive thirst, burning sensations, bleeding, dizziness and inflammation (especially in the GI tract). The hot, light and oily essence of sour foods can disturb your constitution. You may feel extreme thirst, too much heat in your muscles, pus formation in wounds, burning feeling in your throat, chest and heart. On an emotional level, it may increase feelings of jealousy or envy. Salty food is light, hot and oily in nature so Pittas should stay away from them. The salty taste can obstruct the senses, increase body heat, aggravate skin conditions, lead to inflammation and cause graying of hair, wrinkles and rupture tissues. Drink a tall glass of sweet lassi with your lunch to aid digestion and cool your system. Avoid ice-cold water to quench thirst. Thanks for sharing your thoughts about westernizing.